HE’S SMART, QUIET, LOVED BY HIS PEOPLE… AND an emerging threat to the Zionist program of international Jewry. With the vast majority of Egyptians approving a new constitution last week, the outcome will surely result in General al-Sisi becoming Egypt’s next popularly-elected president. A military-backed government is vigorously supported by the Egyptians who applaud the military’s ‘no-choice’ deposing of Morsi last July following mass protests over his rule. “He’s Egypt’s deGaulle!” proclaims the country’s prime minister, underscoring the people’s hailing al-Sisi as a “saviour” who delivered them from the Muslim Brotherhood. And in the euphoria of al-Sisi’s presidential prospects Egypt’s stock market is soaring. “You turned your back on the Egyptians and they won’t forget that. Now you want to continue turning your back on us?” View Entire Story Here. This undisguised rebuke against Jewmerica’s Obama foreshadows an anti-Zionist posture by an emerging Egypt in the affairs of the Middle East with the VERY popular al-Sisi at its head. The backlash against al-Sisi is now in full swing. It’s called, “The New Sisiphobia,” where just like his Jew masters, Obama ignores the plight of Coptic Christians—(and all Christians worldwide)—but caters to radical Islam, a destabilizing force that furthers Jewry’s agenda of divide and conquer. Led by by Jew-owned Time Magazine and the UAE’s The National, al-Sisi is belittled as a “new pharaoh” and “unfit” to rule. But Egypt’s “new pharaoh” is hailed as the “Eagle of the Arabs” in the tradition of Saladin. The “Eagle of the Arabs” is loved by both Muslims and Christians in Egypt. A devout Muslim himself, yet in pursuing a secular government wherein all minorities are insulated from persecution, al-Sisi has vowed to protect Egyptian Christians. And strongman al-Sisi with pan-Arabic underpinnings and a recently inked military deal with Russia is making Jewry very nervous indeed. When I was in NYC for Street Evangelism in December an Egyptian cab driver took me back from my Wall Street Evangelism. When I asked him what ethnic origin he was from he told me he was from Egypt. He was a very intelligent looking man in his early 50’s who formerly worked as an accountant. I casually asked him what he thought about al-Sisi. Well, the floodgates of praises came forth from my cab driver friend after I concurred that I liked al-Sisi too. The remainder of the cab ride was hearing my Egyptian friend SING the PRAISES of al-Sisi and how ALL the Egyptians LOVE al-Sisi SO MUCH and HATE Morsi SO MUCH and the Muslim Brotherhood JUST AS MUCH. When the topic came around to IsraHell, the cab driver intimated that al-Sisi will become a huge threat to the Zionist program reflecting the anti-Zionism of the people…but NOT before al-Sisi lulls Israel and Jewry to sleep. VERY Interesting! AS YOU MAY HAVE NOTICED, I am posting MANY more Articles than I have in the recent past. I will be doing regular “Shorts” like this Article to keep readers abreast of the latest events affecting our Jew-ridden world. Please help me CONTINUE this very important service to our hapless Jew-ruled world. SIX DAYS AGO I received an email from a long-standing benefactor whose substantial funding has been going for my rent and living expenses. He informed me that he was no longer going to help me. This was a HUGE BLOW. I’m at my wit’s end in total “survival” mode. Now I’m not only struggling to keep the site online but to keep a roof over my head AND fed as well. I sometimes get emails questioning why this site is so expensive to run. Don’t these people realize that my living depends on donations too? A good bit of news no doubt. It seems like Jewry is having a rough go cornering its Middle Eastern Axis of control. They are pathetically failing in Syria, Iran and soon to be Egypt, although many others under their yoke in the Arab world and here in the West are weathering this nightmare with baited breath. It’s only an amount of time until our discontent and ardor of resistance on the internet becomes a viable force in the political arena. There is without question people like Brother N and others who are willing to put their life on the line for the benefit of our future. Something all of the ZOG hacks lack both mentally and in their heart. Keep up the great work my fellow Christian and Patriot. I can’t wait until your Federal Reserve video hits internet. I will pass it on to my comrades. I’m STILL working on my NEW Vid about ending the Fed. An anonymous donor is funding it. The illustrations are very special on this Vid and I want to get them JUST right. Concerning Egypt, IMO this is sadly off the mark. The US has never stopped funding the Egyptian army. Al Sissi is in hand with his Jewish masters, look what he is doing to people in Gaza. Facilitated the Jihadists to go to Syria to wreck that country. Now even the liberals are demonstrating alongside the Muslim Brotherhood in the streets of Cairo. The Coptic Christians once again played the wrong hand so they will be on the receiving end. The Morsi presidency was sabotaged from the begining as the NWO stooge Baradei(?) was rejected by the people of Egypt. Egypt is slowly descending into Jihadist hell as the Western democracies remain silent, but bent on ousting the democratically elected Ukrainian government as per the command of their Jewish overlords. Morsi was NOT perfect but the 1st elected president ever in Egypt. I applaud your efforts to keep your readers informed of developments especially as they are about to flow quite dramatically particularly with a financial collapse imminent. May I suggest pondering the following comments. Short rebuttal as I am wiped out. The majority of Egyptians are ant-Zionist and pro-Sisi. That says a lot. Jew-owned Time, Jew York Times, and Jew Rothschild-owned The Economist, ALSO belittles al-Sisi. That says it all. Al-Sisi MUST move very slowly as he FIRST wishes to stabilize his country. That means discretely appeasing Israel and affirming the Camp David accords. The man is not stupid. Thus USA is obligated to arm Egypt vis-a-vis the Camp David accords. But as the Egyptian cab driver told me, who has family and relatives in Egypt, once al-Sisi establishes his reign and stabilizes Egypt he WILL become a THREAT to the Zionist program. Yes, Morsi was “elected” by popular vote BUT it didn’t take long for the VAST majority of Egyptians to come to HATE the man. Right before he was POPULARLY deposed, the maniac Morsi called for “jihad” against Assad playing into the hands of Jewry and Jewmerica. The people and the military BOTH would have none of Morsi’s “jihad” and quickly ended his reign. AND - I can assure you (as you SHOULD know) that al-Sisi is NOT a Jew. This was a LIE spread by the Muslim Brotherhood to discredit al-Sisi AFTER he toppled Morsi. Prior to that, the Muslim Brotherhood lauded al-Sisi as being a Brotherhood member. That said, I DO appreciate your financial support even though we disagree now and again. Maybe it’s because I don’t have enough information to form a fair and balanced opinion of Mr Al-Sisi. But I can’t help thinking that he’s just a stealth Jew pawn, a wolf in sheeps clothing, a whited sepulchre, which indeed appears beautiful outwards, but within is full of dead mens bones, and of all uncleanness. If the Jew media aren’t vilifying him then something has got to be up, right? Greetings in the Lord, dear Brother Nathanael. 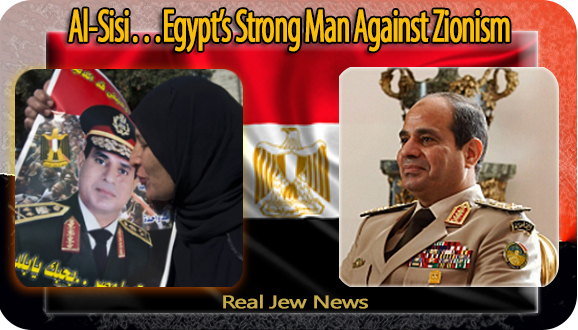 Outstanding follow-up on your masterpiece from last year, Egypt’s Revival of Pan-Arabism @ http://www.realjewnews.com/?p=844 and your coverage of General Al Sisi and the military intervention which ousted Morsi. In case anyone missed it in the link that +BN provided, the reason the Egyptian military had “no choice” but to intervene on behalf of the Egyptian people is because their constitution provided no political remedy such as a recall or referendum to oust Morsi politically. This has hardly been mentioned at all in the Judeo-Western media. As far as the accusation of Al-Sisi’s mother being a Jew, I commented on this back last August. The source was the Muslim Brotherhood, scarcely an unbiased report, and the smear was backed up by Jewish press and “Middle East” experts who had reasons of their own to attempt to discredit Al Sisi among his fellow Egyptians and on the Arab Street. In short, the Tamarod (Rebellion) Movement, which played a major role in the July 2013 protests in Egypt and the ouster of Morsi, joined a popular grassroots campaign calling to stop US aid to Egypt, and to cancel the 1979 Camp David peace treaty with Israel. This is the Muslim Brotherhood accusing General al-Sisi of being a crypto-Jew. It is a common tactic in the Arab world to accuse one’s political enemy of being a secret Jew to attempt to discredit them. Qaddafi was a “secret Jew.” Bashar al-Assad is accused of being a “secret Jew.” When Morsi appointed al-Sisi he was a good pious member of the Muslim Brotherhood (according to the Muslim Brotherhood); when Morsi was sacked by the Egyptian people, al-Sisi becomes a Jew (according to the Muslim Brotherhood). And even if his mother was a Moroccan Jew as alleged who hadn’t converted to Islam, because the father is Muslim, any children would still have to be raised as Muslims. Gamal Nassar is the man making the claims that Morsi is a “secret Jew.” Nassar is the former media secretary to the General Guide [Guidance Office(?) — the information and propaganda arm] of the Muslim Brotherhood. He aired these claims on the Pro-western, neo-Zionist Qatar government-funded, Morsi and Muslim Brotherhood sympathizer Al-Jazeera network on August 17, 2013. On the other hand, when Morsi appointed al-Sisi, the Muslim Brotherhood started the rumors that he was a member of the MB, that his father, uncle and children were Brotherhood members, and that his wife wore a veil. They also claimed that he was an instrument for the Brotherhood’s quest to Islamize the armed forces and induct them into the Brotherhood. The Brotherhood’s aim in spreading these rumors was apparently to make the Egyptian people lose hope about keeping their army purely nationalistic and apolitical, free from the dangers of political affiliation and frequent lies, and break their trust. Approximately 96% of the Egyptian people trust their military. General al-Sisi embraces the principle of Egyptian nationalism and secular government “based on the principles of Islam,” (but not Islamic religious law or Sharia itself), both of which the Brotherhood opposes who strive for an Islamic state under the rule of Sharia. He grew up in the Gamaleya neighborhood of Cairo which is a poor area, his family known to be a pious conservative Muslim family but also Egyptian nationalists who were loyal to Nasser; his father was a shop owner and artisan in Muslim religious arts and crafts; he has extended family in Cairo. MEMRI was co-founded in 1998 by retired Colonel Yigal Carmon who spent 22 years in Israeli military intelligence, and Meyrav Wurmser, an Israeli-born, American political scientist. The founding staff of seven included three who had formerly served in military intelligence in the Israeli Defense Forces (IDF). Carmon later served as counter-terrorism adviser to two Israeli prime ministers, Yitzhak Shamir and Yitzhak Rabin. Wurmser, who later left MEMRI, is an Israeli-born, American scholar of the Arab world. She is also a Senior Fellow at the US think tank, the Hudson Institute, who participated in a study that led to the report, A Clean Break: A New Strategy for Securing the Realm, a paper prepared for Likud party leader and then incoming Israeli Prime Minister Benjamin Netanyahu. MEMRI’s current staff includes “people of the Jewish, Christian and Muslim faiths [who] hold a range of political views.” It is based in Washington (although it’s address seems to be a secret) but with recently-opened offices in London, Berlin and Jerusalem. Anyway, I located El Watan (MEMRI translates it as Al-Watan) which is an independent French language newspaper in Algeria, that the Muslim Brotherhood spokesman Gamal Nassar claimed as his source as the originator of this rumor, but without mentioning the issue or the date or providing any other references. Of course, none of this could possibly have anything to do with the fact that the grassroots Tamarod (Rebellion) Movement, which played a major role in the July 2013 protests in Egypt and the ouster of Morsi, has joined a popular grassroots campaign calling to stop US aid to Egypt, and to cancel the 1979 Camp David peace treaty with Israel. Tamarod [movement], who played a major role in the ousting of Egyptian President Mohamed Morsi, demand the Egyptian regime to hold a referendum on banning US aid, cancel the peace agreement with Israel, and reword security-related treaties to allow Egypt to revive its national sovereignty. The movement claims that Israeli and international peacekeeping forces in Sinai prevent the Egyptian military from sending more forces to the peninsula to stop terrorist activity in the area. Daily News Egypt quotes the movement’s media coordinator Mai Wahba as saying the campaign will collect signatures from people, and that there was no timetable for the campaign yet. The “No to US aid” campaign had gathered 300,000 signatures in August. Interesting how this has been ignored or downplayed in the Western media, but played up in the Jewish press. You do know that Tablet Magazine is also Jewish owned, Jewish run, and meant for Jews? Israhell is part of a disinfo campaign to discredit General al Sisi, a popular trusted figure among the vast majority of the Egyptians. The Jews had no problems with Morsi because from the start, he affirmed that he would continue to hold up the 1979 Camp David Peace Treaty. Jews have no problems themselves claiming someone else in the Arab world (or elsewhere) is a Jew if such a lie is good for the Jews, because Jews, particularly Zionist Jews, must have anti-Semitism to keep their perpetual victimhood going. And, they came to good terms with Morsi, his government, and were “getting used to” the Muslim Brotherhood as well. Israhell is keeping fairly quiet about Egypt since there is a large political movement seeking a referendum to shut off US military aide to Egypt, a major condition of the Camp David Peace Treaty between Egypt and Israhell. The Tamarod movement is also seeking a referendum to abolish or renegotiate the Camp David Peace Treaty. You can bet that Israhell is not happy with this prospect, either, so why not join in the chorus and parrot the Muslim Brotherhood’s accusative insult that General al Sisi is “a Jew” in order to shake the confidence the Egyptian people have in him and the military? P.S. Tablet Magazine is also a Jewish magazine. Did you read my Article? The Jew-owned Time Magazine (primarily owned by Israeli JEW Aviv Novo) HATES al-Sisi calling him a “new pharaoh” and “unfit” to rule. The Jew York Times and Jew Rothschild-owned The Economist ALSO belittles al-Sisi. Be careful. JEWS like dim-witted Steven Lendman WANT you to HATE al-Sisi. Thank you for citing my “no choice” that al-Sisi was presented with in dealing with the POPULARLY HATED Morsi by referring to the embedded link. It’s VERY important that people click on my embedded links as they SUPPORT my assertions and many times EXPAND on my statements. This is unlike the moron Dave Hodges who NEVER provides sources for the MANY false assertions he makes. Sometime he does embed a “supporting” link. BUT the ones I checked are government sites that do NOT support what he’s asserting at all. Apparently, he hopes no one will click on the few embedded links he provides. STAY AWAY from Hodges’ “Common NONsense Show” UNLESS you want to be MISLED by FALSE information and idiotic conspiracy fantasies. Stay tuned for MANY more “cutting through the haze” Articles. Please HELP me to do it! I just recently listened and read an article by Jonathan Azaziah who also question Al-Sisi a lot. You said the Muslim Brotherhood is spreading lies about AL-Sisi being a Jew. But what do you think about the opinion of Azaziah, also a Jew, who is at least as strongly opposed to the Zionist Jews as you and this article by Kevin Barret? I hope you can understand my German English. First of all, please help Brother! His welfare should concern us all. If we all sent what we could, the thousands who watch him, he would have enough. Send it in the regular mail: The Jews are on the march everywhere. I hope this General can free Egypt from them, and that his quiet ways are pure tactics. The Jews operate with chaos, division, bribery, slander, and threat. MONEY is something they REALLY Understand. While many gentiles fall for the ‘hard work’ bunk. They collect together to assist one another, to succeed. This is their key to success, leaving all the rest of the world poor or stuck in drudgery that they laugh at. Extremely well put and revealing! As you stated in your article http://www.realjewnews.com/?p=844 , Egypt can choose to uphold the Camp David accords and receive US military aid, or turn to Russia and Iran. Kevin Barret says Egypt is now “Israeli-occupied territory?” What a joke. These kinds of “catchy” statements NEVER apply to the REAL world. Why doesn’t Barret ask 9 out of 10 Egyptians if Egypt is “Israeli-occupied territory” and they’ll laugh in his face and then punch him in the mouth for his stupidity and UTTERLY ungrounded assertion. It’s VERY difficult to get sober, reliable political information and commentary on the net. Real Jew News is ONE OF THE FEW SITES where you can count on RELIABLE information BACKED up by facts and sober analysis. Jim Lobe of the up and coming LobeLog is another reliable political info and commentary analyst. He deals in FACTS and sober analysis just like I do. Lobe was in MSM for many years and is NOW coming out against the Zionist agenda. Many others will be following. Al-Sisi is currently in the throes of STABILIZING Egypt and MUST maintain the status quo UNTIL his country is stabilized, until he lines up reliable allies, and begins to bring some economic prosperity to Egypt. He is NOT a stupid man NOR does he run a “truth” Website that appeals to the opinions of alternative news aficionados. Al-Sisi, like Putin, deals in REAL POLITIK and NOT what people are itching to hear that fits into an impractical agenda. The art of what’s possible is what politics is all about and not what it takes to run a Website. What I’m doing with these “Shorts” is PACKING a TON of information into a very brief piece. You are indeed a well informed and intelligent man. All the clever and still free, political leaders need to act ‘On-message’ for survival in the Zionist run world. Egypt must remain free from too much interference, but as you say, the leadership will hopefully controll its own destiny, and one day form an alliance to destroy Zionist power. PS. Good Jews in England have fallen foul of the Zionist press. They have been protesting against ‘Zionist Aggression’. The picture was bereft of the real banner they were using, and were actually pro-Hungarian Nationalist in favour of Jobbik’s visit to England. Mubarak is a patriot, and General Sisi has saved Egypt from becoming another Iran [Islamic republic] under Muslim Brotherhood rule. Check it in Hebrew: Ma’riv newspaper archive, if you know Hebrew. Of COURSE the Israeli ambassador TO CAIRO announced these INGRATIATING words to al-Sisi. A real good Jew politician isn’t he! But 9 out of 10 Egyptians would challenge these obvious words of flattery aimed at creating a policy posture re al-Sisi’s regime. Nice try! Just yesterday the Jew Economist put out a major Article condemning al-Sisi. SUCH a hero for Jews! He’s not a Jew. It’s a lie promulgated by the Muslim Brotherhood to discredit al-Sisi. We have documented this very carefully. Your journalist is using sources that do not support her assertions at all. Neither does Barrett. The Israelis were crapping in their pants SCARED TO DEATH that al-Sisi was going to cancel the Camp David accords. This is why they were “praising” him. But in the REAL WORLD…and NOT Cyberspace…this would have been STUPID for al-Sisi to do as he would’ve lost US military aid. The man is NOT stupid. Al-Sisi is an Egyptian nationalist and will do what’s best for Egypt. Now that he approved for the most part the Camp David accords the Jews are mouthing out at him again. 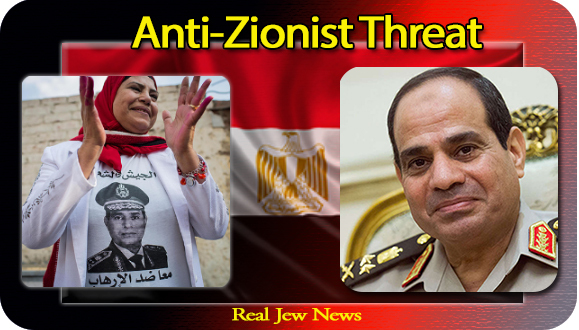 As for the Sinai, al-Sisi cannot give the Israelis a reason to invade which will threaten the Suez Canal. And that is sadly the best we can ask for. A man of integrity who is a Muslim, to protect Christians. Jews just don’t like that. Bro. Nathanael, you never cease to amaze me. I’m so glad I found your website a few years back; and, of course, I’ve never really left it. Sun Tsu used just about the same tactics toward his adversaries; that is, to lull them to sleep, before striking; though, I’d say al-Sisi is doing this in the political arena instead of the military battlefield, at this point. As you said, Bro. Nathanael, al-Sisi is not stupid. I’d say he is brilliant, as Sun Tsu was brilliant in his day. The late French leader, Charles deGaulle, was a very brilliant, courageous patriot as well. He stood up to IsraHell and Zionism without hesitation; he put his nation (France) first. The late JFK did that also, but he was assassinated. If only the US had such leadership today; the truth is, we haven’t had it since JFK. LBJ and all of his successors abandoned true patriotism and towed the Zionist line, to the nation’s downward spiral. Pan-Arabism and the Ba’athist ideology of uniting the Arab speaking world has always been a threat to Israel. If these nations are not destabilized, how can Israel and America take control of them? Something similar happened with Ghaddafi. There must always be conflict for the Tribe to succeed. I tried myself the El Watan site using all sorts of combinations. I could not find anything about Al-Sisi. Zero, zilch. The man making the assertion (Nassar) was lying. I tend to believe that the “coup” in Egypt is of a greater magnitude. Judging by who is crying wolf. I was of the opinion (that many people laughed at) that the Muslim Brotherhood was actually in cahoots with the Zionists and that all the fake “Arab Spring” revolutions were meant to bring in power MB who would then support the take over of Syria and after that Iran. I even predicted that the fate of Syria would change dramatically after the defection of Egypt. Yes, I WILL be vindicated with regard to al-Sisi. There is SO MUCH garbage out there being passed off as “alternative news” like Barrett’s asinine take on al-Sisi. The General is a “Nassarite” at heart…a “pan Arabist” who would have NONE of Morsi’s “jihad” against Assad and his secular government? We must be patient. Why are the Jews NOW attacking al-Sisi?…now that he affirmed to a large degree the Camp David accords. BECAUSE now that that’s a done deal they FEAR that in time he will create an EXPANDED “axis of resistance” that extends from Iran, through Iraq, to Syria, and to Egypt. General Al Sisi seems like a good man, he still puts fear into the hearts of international Jewry and their anti-Christ agenda. He also has the honour and integrity of a good leader, yet as with most generals, I am always cautious to make any assessments until he gets the job done and cleans house with the Zionists. You even have trusted the word of an ordinary Egyptian cab driven living his entire life in the USA. I adore Br. Nathanael’s opinions so much that I quote him wherever I can. It is very difficult for me to understand why he supports Al-sisi’s murderous track record and takes the word of an American Egyptian cab driver as the gospel truth. We know that all Egyptian Coptic Christians are against the new constitution drafted by the Muslim Brotherhood because Sharia was given an important place in it. This Egyptian cab driver must surely have been a Coptic Christian to love Al Sisi for this same reason. I would appreciate if you would review the following article and convince me that its author is mistaken in her opinions about Al Sisi. A commentator I respect a lot is Thierry Meyssan. The information in his piece http://www.voltairenet.org/article179909.html entirely supports what Bro Nat has affirmed concerning General Sissi and his strong support amongst the Egyptian people. The article contains some claims I had not heard elsewhere, for example that Morsi had plans to privatize the Suez Canal and eventually sell it to his Qatari backers. No doubt there are many strands of opinion amongst individual members of the Muslim Brotherhood, but the fact that this organization was originally set up with the assistance of British Intelligence should make us deeply suspicious of its aims. Perhaps the best way to view it is as an instance of the “useful idiot” stereotype. I just got back from my Street Evangelism Holding High The Holy Cross of Christ here in Ski Resort haven in the Rocky Mts of Colorado where we are immersed in 14 inches of BEAUTIFUL “powder” snow! As for Makow’s woman faux journalist, (she only uses a first name the coward) who posted the NONSENSE that al-Sisi is a “Jew” I ALREADY answered below. You see dear Ash, my BIG problem is dealing with ingenues like you whose minds are SO narrow that they cannot see beyond the CRAP that’s put out by two-bit “truth” morons. As for the cab driver that you seem to know “has been a cab driven all of his entire life in NYC,” I am amazed at your ability to know the life of a person you never met. How do you do it? Surely, you must have spent many years cleansing your soul in ascetism to reach the heights of clairvoyance you have attained to. However, Mr false prophet, the Egyptian cab driver was an ACCOUNTANT IN EGYPT for MANY years and when he came to America 6 years ago could NOT get a job in his profession. Thus he drives a cab. Don’t you read the news? 98% of the Egyptian people FAVOR al-Sisi’s toppling of Morsi. Why do you oppose PLAIN FACTS? You see, oh yes indeed, Morsi was “democratically elected”…but after a very short time in office he became “democratically HATED” just like Obongo. Would that we had a great al-Sisi here in Jewmerica who would get rid of the imposter in the White House JUST like al-Sisi did to the HATED Morsi. Now, if 9 out of 10 Egyptians LOVE al-Sisi, that means that MOST Muslims LOVE al-Sisi who make up the majority of the Egyptian populace. May I make a suggestion to you that perhaps will enlarge the narrow confines of your teeny weeny brain? Stay away from two-bit journalists like the one you quote on Makow’s site and read a REAL journalist who doesn’t play to imbecile minds of the “truth” movement. Again, my BIG problem is having to chase off ingenues like you who do NOT grasp the fine art of ‘Real Politik’ which is the art of what’s possible and NOT third-grade attempts to post political commentary on “illuminati-exposing” websites. According to Dr. Makow Putin is an “Illuminati” and a “crypto-Jew” too. He shouldn’t be taken too seriously. Neither Kevin Barrett also, who is a Muslim convert, married to a Morrocan woman, apologist of Muslim Brotherhood, and “professional” conspiracy theorist. Thanks Br. Nathanael. I am at fault for assuming the Egyptian cab driver to be a Coptic Christian and an American for more than two decades. I want you to be right on Al Sisi. Earnestly hope you are right and I am wrong. Time will prove one way or the other. Interestingly, RT (Russia Today) has been reporting that there are mass protests against Al-Sisi, and that the vote in favor the constitution was fraudulent and campaigning against it was not allowed. From watching them you would think the majority still supports Morsi. I wonder what could be behind their promoting of this view? I know some key people who work for RT in Moscow. I know how it operates, its history, its administration, and its trajectory. RT is an international news agency that reports political situations in various places in the world. They are not “promoting this view” that the recently popularly approved (by a landslide vote) “constitution was fraudulent and campaigning against it was not allowed,” but reporting what the claims are to justify the violent mass protests (including rioting and terrorist acts) by radical Islamist mobs supporting the Muslim Brotherhood. Legitimate opposition parties were allowed to campaign, but not the the Muslim Brotherhood which was delegitimized last December. Most of the protestor thugs are Muslim Brotherhood and their political Islamist affiliates, and their bogus “secular” political party fronts. I have read that the Al-Sisi regime closed up the tunnels into Gaza and tightened up on access to Gaza through the Sinai. If these are facts, then Al-sisi is supporting Israel. I have addressed this issue already you narrow-minded Cyberspace junkie. Don’t you know that terrorist ISIS is working with anti-Assad elements in Gaza and the Sinai? Al-Sisi MUST do every thing to STOP the terrorists with their enclaves in the Sinai or Israel will have a pretext for occupying the Sinai and threatening Egypt’s economic viability of the Suez Canal. You’re basically a brainless armchair pundit who spouts off a few sentence or two without seeing the entire context of an issue. GAZA —The Egyptian military is resorting to a pungent new tactic to shut down the smuggling tunnels connecting Sinai and Gaza: flooding them with sewage. Along with the stink, the approach is raising new questions about relations between Egypt’s new Islamist leaders and their ideological allies in Hamas who control the Gaza Strip. As far as conditions in Sinai and Al Sisi as the chief military commander goes, +BN is entirely correct. Al Sisi is an Egyptian nationalist through and through, in other words, he is looking out for Egypt’s national interests first and foremost, particularly with Sinai, of which Gaza borders on. Sinai is a very lawless place with organized crime, terrorists acts against Egypt as well as Israel, (just recently an oil pipeline supplying Egypt was blown up by radical Islamic terrorists), Bedouin nationalism, troubles with the Muslim Brotherhood offshoot — Hamas — ever since Sunni Hamas turned against Syria, and what not. Tourism is integral to Sinai and Egyptian economy and a major land buffer between Tel Aviv and the Suez Canal. The latest to emerge in Sinai is the militant fundamentalist al-Qaeda affiliated Islamic State of Iraq and the Levant, or ISIS, who have been terrorizing Syria, fighting with other radical Muslim groups of the Syrian “opposition” and now control a portion of Iraq trying to set up their fuedal medieval emirates, complete with putting decaptitated heads on stakes as a warning to communities they’ve taken over. And if you don’t think ISIS creates problems for everyone in the region, which the Muslim Brotherhood is sympatico, just look at the YouTube brag videos by ISIS. “Members of the Islamic State of Iraq and al-Sham (or the Islamic State of Iraq and the Levant) have executed dozens of prisoners being held at a children’s hospital in the Syrian city of Aleppo. “The hospital had been used by ISIS as their headquarters until they were forced into retreat by other opposition groups. How about ISIS Takfiri thugs murdering in cold blood innocent truck drivers for “not being Sunni enough” according to ISIS’ criteria? As far as Al Sisi closing the Gaza tunnels, the suddenly precious Morsi did as well, a year ago February, as +BN has posted. And not only did he merely close them, he did so by filling them up with sewage, which the Gazans eventually pumped out. How insulting is that? You focus on smuggling going just one way into Gaza, but don’t consider the fact that Hamas, no longer a part of the ‘Axis of Resistance’ to Israhell having turncoated on al Assad, and other militant groups are smuggling arms and war material into Sinai, where ISIS is building a formidable base, particularly among some of the Sinai Bedouin tribes, who are Arabs, not Egyptians. You and other people complain about how all this smuggling affects the Gaza economy and Gazan employment, but stop and think man, what crappy little Zionist country in the Middle East created these conditions to begin with? Which little rogue state is stealing and occupying Palestinian land, and is keeping Gaza in this situation of seige where smuggling from Egypt is the main thing that keeps the Gazans alive? And who is really benefitting from the smuggling? The Gazans have to pay an exorbitant amount to the Hamas government as a “smuggling tax” from these tunnels as well. People have to stop being lazy and start reading beyond their cyber-comfort zone of being entertained by conspiracy fantacists (love that term, +BN) and the usual alternative sites, like Veterans Today and Makow. Trying to get away from “the clash of civilizations” garbage, and to get a handle on the complexities Middle East politics is very difficult if one spends only 5 minutes a day doing so, and depending on bare regurgitation from various sites. Everyone has to check for an author’s “bias” in their stories and opinions, such as Seraphim has pointed out about Kevin Barrett — its important to know that he “is Muslim convert, married to a Morrocan woman, an apologist of Muslim Brotherhood. This is therefore necessary to know, because this means that Barrett is subjectively and ideologically opposed to Al Sisi’s secularist and nationalist ideals of the Baathist (Arab Socialist) ideology; meaning Islam, particularly the Sharia does not become the state religion, as in the secular republics of Syria and Egypt. Thanks for double checking the French language Algerian news journal El Watan site. Clearly, Gamal Nassar, the Muslim Brotherhood mouthpiece which kicked off this entire fabrication now making the rounds, was lying from the get go about his source to substantiate his smear campaign that Al Sisi was a crypto-Jew. And, as I recall, Gamal Nassar is Kevin Barrett’s source, as other sites are using this debunk source as well. I heard your appeal and sent you a small donation of $20. Hopefully more people will do the same. As for al-Sisi being a Jew, I don’t believe it. My position is, anyone is better than the Islamo-fascist Morsi or the Moslem Brotherhood. What al-Sisi did is admirable and can’t have been an easy decision, since it involves a big, personal risk. But he heard the Egyptian people who had had enough of Morsi after less than a year. Morsi’s only accomplishments were church burnings, mass killings of Christian Orthodox Copts, the sanction of mass abductions of Coptic girls and women to be forcefully converted to Islam. He destroyed the economical & social order in a very short time by favouring his fanatical MB over the Christians. Anybody who defends this genocidal maniac because he was once elected, is dancing on the graves of the Christian Copts. Obama secretly converted to Judaism. He is now a Zionist puppet. This article’s premise I hold in doubt. If Sisi is not “in bed” with the Zionist Jewish state, then why is he so inhumanely, immorally, betraying the people of Gaza, desperately begging for access into Egypt? He apparently caters to Jews, and conducts bias diplomacy on their behalf. What gives? this is not “Salahudin”! I am an Egyptian Muslim, with all family (on both sides) living in Alexandria and Cairo. Our family is in military, industry, construction and science. Powerful wealthy family, very upper class. Egyptian military controls all industries now in Egypt. Second Suez Canal was built (by the military), huge foreign investments from Saudi Arabia and Gulf states, massive gas project now and tourism is up again. All this was the result of Al-SiSi. We love him. BTW, his mother was not a Jew that was a smear campaign started by the MB and taken from a typical ignorant and uneducated Algerian, with no merits credibility or proof. Furthermore SiSi’s mother name was Soaad Mohamed and she passed away last year. With an Islamic funeral of course. Also FYI, Al-SiSi has increased troops on the Sinai border with Israel, and furthermore has troops going in and out of Gaza to protect Egyptyian national security. Since then the terrorists making problems in Sinai have been smashed. Israel couldn’t do anything about the increased Egyptian troops and presence. Israel defense ministry then released a statement on Haaretz that they support SiSi’s decision to send troops. Sisi is a very clever man. Remember his background was millitary intelligence before he was army general, and then became president. The supreme council armed forces run everything, and we Egyptians have the greatest history and civilization, we’re not going to let anyone or any enemy destroy our great glorious country. Coptic Christians are our brothers. SiSi is nationalistic, he always says we are Egyptian first. Under Sisi, all Coptic churches and institutes are protected, all antiquities, every thing Egyptian. I am and we are Muslim and we wanted Morsi out, he’s a donkey and a sell out, he was going to privatize the Suez Canal, Nile River, Egyptian antiquities–everything. Morsi’s policies were not Islamic but ignorant and political (for money). The Koran forbids (haram) all that he wanted to do. Morsi was an ignorant useful fool, who just wanted power and money. He would have allowed terrorist to flourish in Sinai and he was going to send troops to fight in Syria (our ally under the Arab Republic). So we had the balls to get rid of him. Something the Americans will never have the ability and balls to do with their puppet leaders. BTW- +BN and KathJuliane analysis are spot on and correct, very impressive to see.